Bully Sticks For Your Dog. Yum! Many dog owners have heard the term bully sticks and are wondering what the heck is that? Is it a stick that you are going to get smacked around with by some insecure bully? Or is it a stick used for getting revenge on a bully you met in high school? Well sorry to burst all your bubbles. But bully stick are some very tasty dog treats that your dog will give you lots of wags, barks and licks for. 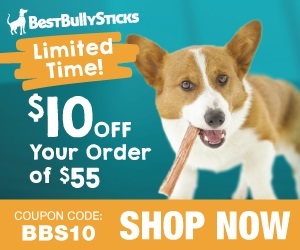 Bully sticks are a tasty, single ingredient treat and highly digestible! Dogs of any breed, size or age can take advantage of their many great benefits while satisfying their natural instinct to chew. Bully sticks are made from high-protein beef muscle which helps maintain clean teeth, a healthy coat, strong muscles and optimal brain function. I must confess, when I bring out these high protien bully sticks for my dog, I swear he does about 15 kart wheels before they hit his plate. How Are These Bully Sticks Made? These tasty and healthy bully sticks are made differently depending on the vendor. BestbullySticks are cleaned and sorted in a refrigerated facility to ensure safety. The bully sticks are then hung vertically from racks and cooked in an oven to ensure that they are bacteria free and safe for dog’s consumption. Hanging the bully sticks vertically removes most of the moisture from the product. The longer that they are dried, the less odor they have. What Is the Chew Time For These Bully Sticks? ​Well, this all depends on the dog breed and his/her chewing aggression. The Bully sticks can last from several hours to a couple days, depending on the dog size and it's chewing enthusiasm. Bully sticks can last over two years from the date of production so you don't have to worry about buying a few bags and your dog has a bully stick for several hours or a day or two chewing. BestbullySticks s are packed and shipped in zip top bags to be re-used time and again. This is a convenient way to store your purchase and preserve the product for a long period of time. Many customers like to store their bully sticks in a freezer to increase the bully sticks’ shelf life and hardness. If your dog does not finish a bully stick in one sitting, simply stick the uneaten portion in the freezer, and it will become hard again for a tasty treat another day. You should not store your bully sticks in the open or outside to prevent insects from attempting to reach them. Want This Healthy Treat For Your Dog? How Often Should I give My Dog a Bully Stick? Try not to over feed your dog on this chew-able treat. It can be given to your dogs once a day. We don’t recommend feeding more frequently than this because the sticks are high in protein, and you don’t want to overfeed with protein. Invisible and beyond: Can an invisible fence keep your dog safe? An invisible fence is a set of wires buried underground along the line of a yard where you’d like to create a boundary for your pet. These wires interface with a transmitter placed somewhere on your property, and a receiver which comes in the form of a collar for your dog. When a dog approaches the wire boundary, the transmitter will send a signal to the collar, and the collar will signal the dog that it cannot go further. This process comes in stages and varies moderately between products. However, the basic concept is the same between brands. When a dog comes within a certain distance of the fence, the collar will start to beep. If the dog progresses further, the beeps intensify in frequency. As the dog is about to cross the fence, the output of the collar will turn into a vibration or electric correction. You will have the ability to change the intensity of the physical “go no further” signal the collar produces depending on the size and character of your dog. The beep and vibration or correction serve as deterrents for your dog and teach him or her to remain within a certain perimeter of your home. There are a lot of pros you’ll find for an invisible fence for your dog. An invisible fence keeps your yard open and aesthetically pleasing. If your neighborhood association does not allow physical fences on properties within their domain, an invisible fence is a great option. The lack of a visual barrier will allow you and your dog to look out past your property line to the wider world. It will also work with most landscaping layouts. Invisible fences are generally less expensive to install than a traditional physical fence. While there are multiple factors to consider when comparing costs of an invisible vs physical fence, by-and-large the invisible fence is the cheaper option. If you’re looking to save as much money as possible, you will have the option of installing your fence without the help of the fencing company. However, the ease of having an experienced representative install your fence and help with the training of your dog can be well worth the money. With proper training, invisible fences can be highly effective means of keeping your dog in your yard, out of streets, and away from potential hazards. It is up to the dog-owner’s discretion whether or not they will leave the dog out in the yard without supervision. The technology of invisible fences has improved dramatically in the last 10 years or so. There are certain invisible fence brands that dissuade your pet from crossing the boundary line, but then, if they cross over anyway, the collar will not shock them when and if they decide to come back home. You can find a number of articles on the internet claiming that an invisible fence is akin to animal abuse. While there are understandable arguments to be made for this claim, the technology can be used in a way that protects without harming your pet. Yes, in the course of training and long-term usage, your dog will inevitably get used to the mild corrections. However, the intensity of the correction can be determined by the pet owner themselves. There are certain functions that allow for a vibration rather than a electrical correction to be administered as well. This negative reinforcement, while unpleasant, could keep your dog out of much more harmful situations such as getting hit by a car. While an invisible fence can keep your dog from running out of the yard and into potentially dangerous situations, it will not keep outside threats from entering the yard. There is no way to guarantee complete safety of your pet. Should another, aggressive dog approach your yard, they would be able to cross over the invisible barrier. This is something to consider when deciding whether or not to leave your dog outside unsupervised. The effectiveness of an invisible fence depends more on dog personality and training than anything else. If your dog is not well trained, is prone to anxiety, or is particularly willful, an invisible fence might not be as effective for them. There are claims circulating that invisible fences can create aggression or anxiety in a dog if they are punished for something they don’t understand, such as crossing an invisible line. However, this is why training with a professional or doing extensive research on how you need to train your pet is an important step in making your decision. A cute but terrifying prospect come also from the stories of pet owners with particularly smart dogs. Dogs such as border collies have outsmarted invisible fences. By sitting close to the boundary, letting the collar beep incessantly, but not crossing to the point of a correction, dogs have been able to drain their collar battery and cross the line without retribution. This intelligence is relatively rare. There are battery backup features with certain brands that you should consider regardless. A fence is as safe as the training a dog receives makes them. The main question of, “Will this keep my dog safe?” is one no one can answer with 100% certainty. A physical fence can pose dangers, just like the invisible fence comes with its own inherent downfalls. I had one dog who has busted through an invisible fence line despite being trained and corrected and became very frightened when she was unable to cross back over to the safe side of the fence. I also had a dog that burrowed under a physical fence during a storm and never came back after running away. The best way to keep your dog safe with either a physical or invisible fence is through training. If you go with an invisible fence, however, training becomes even more important. Consult with a professional and do your research on best training practices.